If quality of guiding were the deciding factor, then Zambia’s Luangwa Valley would probably be voted Africa’s leading safari destination, by a comfortable margin. South Luangwa National Park has game in abundance and no shortage of unexplored, unspoilt wilderness. So far, so wonderful. But how long is it going to stay that way? Never get out of the vehicle – it’s the mantra of safari guides right across Africa. Sitting in the back of an open Land Rover, deep in the bush, this stern piece of advice sounds like one of those crystal clear instructions you really don’t need to think too hard about. Yet part of the beauty of Africa lies in its dangers and no matter how sensible the warning, it is somehow alluring to get down from the vehicle and walk. In Zambia’s South Luangwa National Park guests are encouraged to do just that. But it’s not just the way in which visitors interact with wildlife and the environment that sets South Luangwa apart. Guests are also invited to meet the local people, without whose assistance conservation of this special part of Africa would be a far more difficult task. South Luangwa is nine thousand and fifty square kilometres of wilderness interlaced by an intricate network of streams and tributaries that feed the Luangwa River. These waterways have created a fertile soil that supports a variety of plants and trees creating a range of wildlife habitats. The park has a hundred different species of mammals, nearly five hundred species of birds, around fifty species of reptile and an uncounted number of amphibians and invertebrates, all within an area unspoilt by mass tourism. Three quarters of the park is still largely unexplored. Safaris in South Luangwa are a graduation from the norm. Visitors can stay in the lodges near the park entrance where the accommodation is of a high standard, although devoid of lavish pamperings. From here there are morning and evening game drives, punctuated with a bush breakfast or sun downer drinks by the river before returning to the lodge. Alternatively, and this is one of South Luangwa’s specialities, guests can choose to stay in one of the bush camps. There are several operators in the park with at least one of these remote outposts. Most bush camps comprise a small cluster of tented huts, rondavels or stilted platforms where guests sleep, and a main open deck or open-sided thatched long house with easy chairs and a dining table. The focus is is on comfort, but not luxury. It’s not just the adventure of staying in an unfenced camp where the wildlife wanders freely, mere feet from your room. The bush camps also make the best bases for walking safaris. Although it’s possible to take a walking safari from the main lodges, the remoteness of the bush camps heightens the experience. Walking in the bush with a handful of other guests, single file, behind a guide and an armed scout, Africa comes alive in a way that you just can’t appreciate from a vehicle. A walking safari gives you the chance to stand at the top of a hill with a wonderful view, stroll along dry river beds, through groves of trees or across open spaces, and visit secret springs where elephants come to drink. Guides that walk seem to know more: they have a greater feeling for and understanding of the ways of the bush. 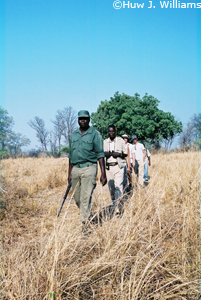 Walking in South Luangwa you get the full benefit of their knowledge. Walking slowly through the early morning with the sun low over the horizon, there is heavy silence stirred only by the crunch of footsteps and the occasional songs of diligent birds. Phil stops regularly, not merely pointing and naming but telling us about spoor, dung, birds, insects, trees, the medicinal uses of plants, which animals eat which plants, which we can eat, and describing how everything weaves together to form one ever-changing, beautiful and dramatic whole. We walk on through a grove, down a small bank and into a clearing with short cropped grass. The low-incidence light on the dew reveals a shimmering silvery patchwork, hundreds of funnel web spider traps woven into the ground. Gently Phil tweaks the mouth of a den and the spider pounces in anticipation. One web was deserted and a new dimension of the bush emerges as Phil explains that this patient predator could have fallen prey itself to a spider-eating wasp. Here is a predator-prey relationship on a totally different scale to big cats and herbivores. A little later in our walk something rare occurred. As we started to climb up the bank of a dry river bed, a large matriarch elephant broke from the bush and charged. The situation was handled calmly, efficiently and quickly by Phil and the scout. We were moved away but when it was clear she was trying to find a way to come down off the high bank and attack, a warning shot was fired and she ran off. That was the first warning shot that had been fired by any scout on a Bushcamp Company walk all season. On average only a handful of situations each year require warning shots to be fired and only once every few years is there a need to kill a charging animal. Given that there are hundreds of daily walks in South Luangwa during the course of a tourist season, these figures are testament to the way that the walks are organised. If a dangerous situation does arise there are two unknowns: what will the animal do; and what will the guests do. Both are taken care of by a professional. 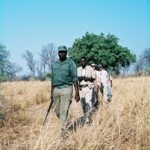 This adherence to safety, and the pristine state of the environment, are what make walking in South Luangwa so special. But it’s not merely the protection of guests that preoccupies the tourism companies operating in the park. South Luangwa is close to a rapidly growing community. Just over the river lie villages that have been steadily increasing in size over recent years. These people are poor and to them the park could be a source of vital resources. Anke Cowan runs Kafunta Lodge and like all the tourism professionals operating in the park she recognises that unless the local people feel a vested interest in protecting the wildlife and its habitat, then their need to exploit their region’s resources could severely damage this delicate ecosystem. “It is essential the local people feel the benefit of the revenue tourism generates”, she says. Employment is one way the prosperity is spread throughout the community as one job can support extended families of as many as twenty people. As well as work for people in the lodges and as guides, tourism generates a spinoff economy of service industries. Tribal Textiles, a local company making high quality batik fabrics for export and the tourist trade, estimates that as many as a thousand people benefit directly or indirectly from the employment it provides. Tourist companies in the park are also contributing much needed infrastructure. Schools, conservation education programmes, bore holes and medical services have all been set up through direct donations and fund raising. The park’s clinic is the only one in Zambia to have its own doctor, provided by the camps to care for guests but mostly treating the local community. Jo Pope and her husband, co-owners of Robin Pope Safaris, are involved in a number of projects and one of their main concerns is education. They have helped fund school buildings, educational materials and teachers’ wages. “The only way this community is going to develop is through education”, says Jo. Funding the schools has not been done in isolation. Guests of Robin Pope Safaris are invited to spend an afternoon visiting the children. Although this has led many tourists to donate, the motivation is not monetary. Jo feels that the guests and the local people should be given every opportunity to meet one another, to foster greater understanding on both sides. With this in mind, she has gone one step further than philanthropy and has advised the people of a local village, Kawaza, how to establish their own tourism product. With her advice they have built a few extra huts and tourists can now stay in the village and see how people there lead their lives. The experience is basic but authentic. If South Luangwa is to remain a park where the African bush not only survives but thrives, the involvement of the local community in tourism and conservation is essential, and responsible safaris are already providing the framework. By giving guests an experience beyond the norm, and bringing Zambians and visitors closer together, all can benefit from the beauty and value of such a wild and priceless place.